Pressure vessel legislation requires that safety relief valves are subjected to periodic testing in order to verify their functionality. Roger Bours reports. 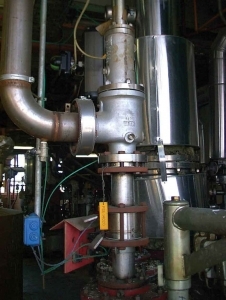 While regular testing of safety relief valves is necessary, the process industries aim to reduce the downtime of the process and costs combined with the highest possible safety levels. If a plant shut down is planned the pressure relief valves can be dismantled and shipped to a maintenance shop for testing on a test bench and eventual be overhauled. The testing procedures are usually according to API 527, a recognised method of testing safety valves for operational fitness and leakage rate. Spring operated safety relief valves require the use of a test bench; therefore the valves need to be removed from the process. This is expensive because of the necessary process shut down, but also because of the cost of dismounting, the use of cranes or lifting devices/access platforms, labour costs, transportation to the maintenance shop, etc. Not every tested safety relief valve needs repair or maintenance so plant operators are constantly looking for reducing the costs so that when a safety relief valves need testing the plant does not require going off line. To achieve this it is possible to install similar relief valves on an upstream change-over valve. One valve is in operation while the second is in stand-by. The stand-by valve can be maintained without having to shut down the process. This method provides a full redundancy of the safety relief valves at an important investment-level. Where the valves exhaust in a common header system an outlet changeover valve with a fail-safe interlocking is required. Changeover valves have a pressure drop typically between 15 and 20 per cent which needs to be taken into consideration when sizing and selecting the discharge system. Alternative API-compliant selector valves with a maximum pressure drop of only 3 per cent are available. Such valves are more compact and do not require oversized valves with higher resulting maintenance costs. Identifying a safety relief valve's set pressure while the protected pressure vessels remains in operation is known as on-line testing or in-situ pressure verification. In-situ testing has become especially popular on processes, which are difficult and/or expensive to shut down such as offshore platforms, cryogenic applications (LNG trains), nuclear and fossil power stations, etc. In-situ testing of safety relief valves provides generally a good alternative to bench testing, it must be mentioned that it will not suit every application and will not eliminate the need to remove safety relief valves periodically for detailed analysis, maintenance and/or replacement of their internal components. - Exact inlet operating pressure at exact time of valve lift. This must be recorded when the disc lifts from the nozzle. - The effective (measured) seat or pressure area and the manufacturing tolerances (not always easy to obtain from manufacturers). - The exact auxiliary load applied to oppose the spring force at the time of effective lift of the valve. Only when all above are exactly known at exact the same time a reliable test pressure can be calculated. Accuracy errors on each of the different input values can have a significant influence on the outcome. The general principle is as follows: The functioning of a spring operated safety relief valve is based on a pre-stressed spring. When the spring force is reached the valve disk starts to move and the valve opens. With lifting equipment attached to the valve spindle, the valve is opened and the lifting force measured taken into account exact seat area and operating pressure. The applied auxiliary force applied to the spindle is usually software-controlled; a force sensor registers the additional force necessary to lift the valve spindle. Chronically with the lift force measurement, the pressure at the inlet of the valve must be measured. The set point result is achieved by calculation where the achieved accuracy will depend on the accuracy and stability of the measurements at the time of the test over a period of time. The best accuracy proven and advertised by most in-situ test providers is 3 per cent; this is the limit of deviation of set pressure allowed by ASME VIII & PED when setting a relief valve. 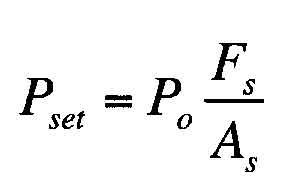 It is of highest importance that all factors used to calculate the set pressure is as accurate as possible, especially the pressure under the safety valve (Po) and its stability over the time of measurement. It is critical that all conditions at the valve inlet need to be stable. This can only be achieved if an suitable bursting disc is used to isolate a safety relief valve inlet from the process and for the duration of the in-situ testing a stable and monitored pressure is applied (minimum 70 per cent of set pressure would be recommendable). Special designed bursting discs with a bypass needle valve between process and a pressure sources could offer a solution. - Protects the valve from possible plugging and corrosion, providing a clean break away force during in-situ testing. - Allows pressurisation upstream side of the valve up to 70-75 per cent of set pressure assisting the lifting devices. - Allowing faster in-situ testing and correct calculation of the set pressure. Fike is a globally recognised supplier of products and services that protect people and critical assets from dangers such as fire, explosion and over-pressurisation. With more than 60 years experience manufacturing products ranging from rupture discs and explosion protection systems, to fire suppression and fire alarm systems, Fike offers reliable solutions for customers around the world. These are intended to deliver reliable safety products that exceed customer expectations. Overpressure conditions can lead to a variety of disasters - injuries, damaged equipment, business interruptions and downtime. Specialists in rupture discs (rupture disks), bursting discs and the isolation of pressure relief valves, Fike has specific rupture disc products for different applications, rupture disc isolation procedures for pressure relief valves (safety relief valves), rupture disc calculation tools and rupture disc accessories and holders. The company's laboratory and testing services are available to certify custom products developed for specific customer applicdations, including those manufactured for aerospace/defence contracts, special gas handling applications and many other variants of standard product offerings.